Some items have a direct link in the Table of Contents. Some items don’t have a link in the Table of Contents because that item has several links — scroll down this page to get to those links. And some items don’t have links in the Table of Contents because the item is on this page, just scroll. (6) Slogans for Posters etc. It’s NOT the taxes, It’s the Effect on Real Lives, Stupid. A concise list of the serious and destructive effects this is having on people’s lives. Compiled by Patricia Moon. 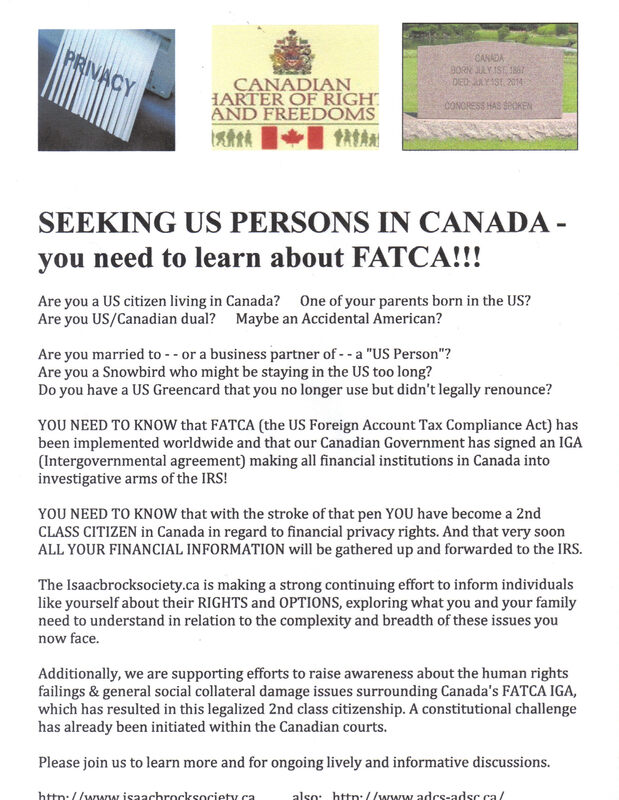 Sheet of Links, similar to above, prepared for Hamilton, Canada, Info Session on Solving the Problems of US Citizenship, March 2015.
eh freeman for FATCA sheet February 2015 Canada handout. 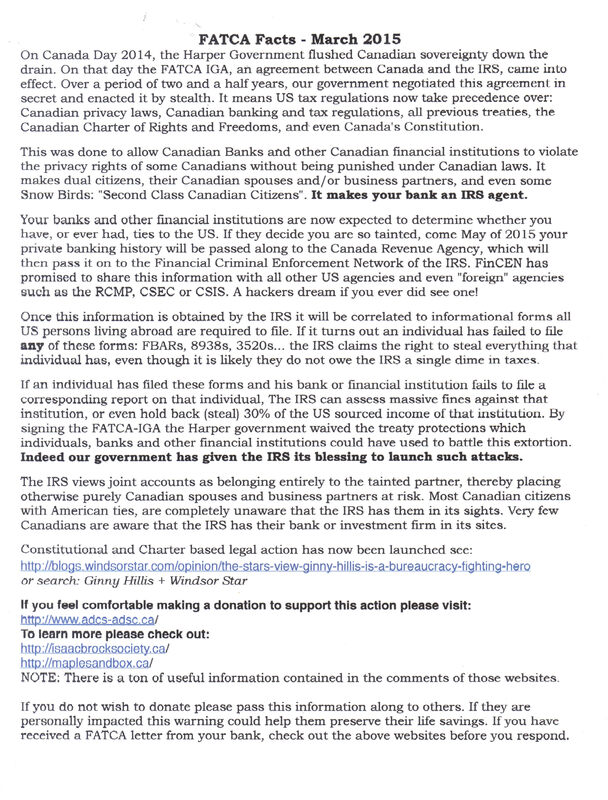 LM for Seeking US Persons in Canada handout and the Links list handouts. 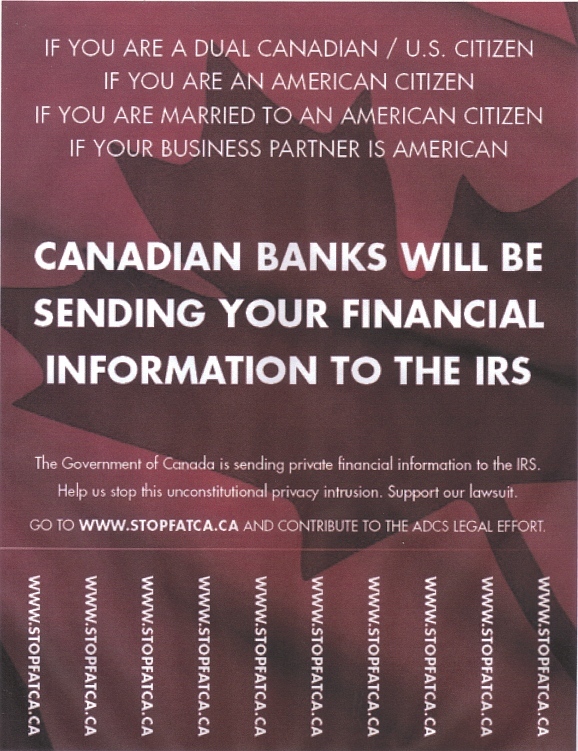 Gwen for creating and designing the Stop FATCA with pull-tabs handout. 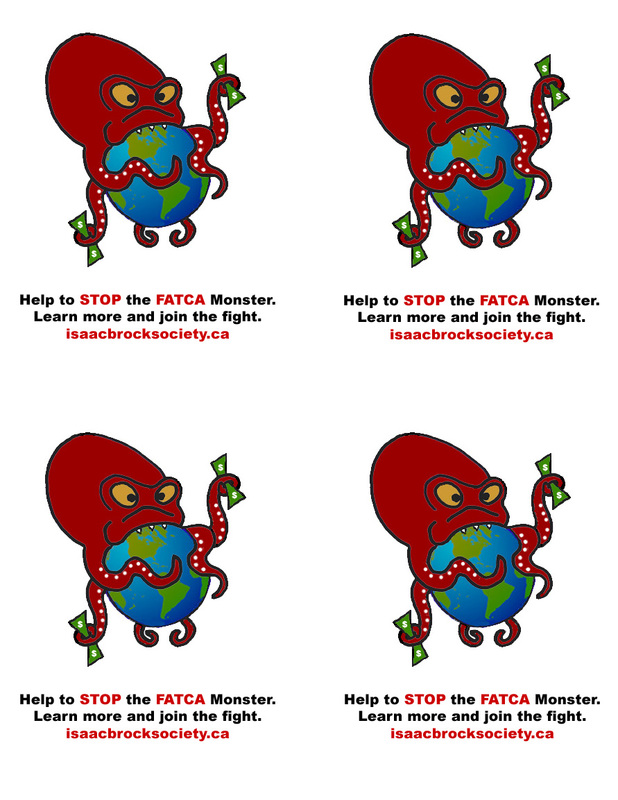 EmBee for creating and designing Stop the FATCA Monster handout. Lynne Swanson, author of the We Are Not a Myth and the We Are Not Tax Cheats brochures, and to Gwen for their graphic design. Thanks to LM for creating these. Fact Sheet for all countries. 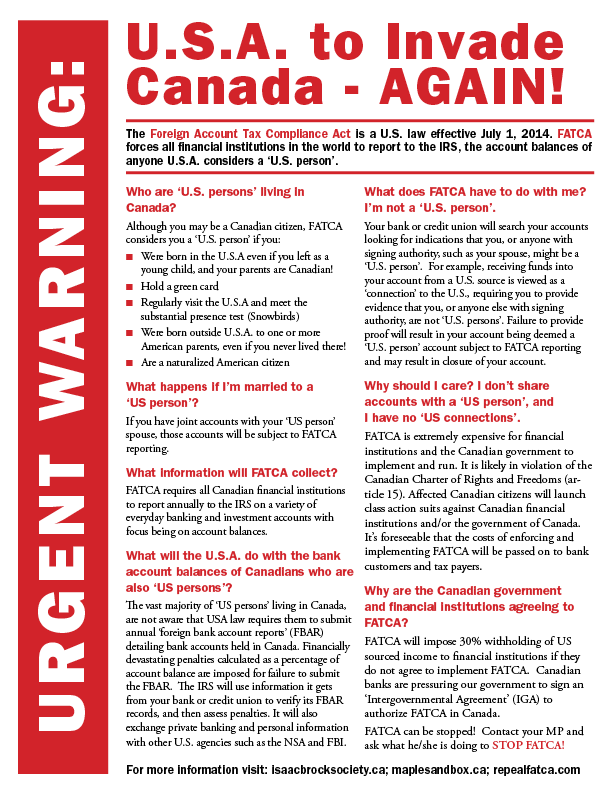 CANADA Fact Sheet (available in a graphic layout as well as a plain document). Canada FATCA Fact Sheet (PDF) This PDF is a plain document. 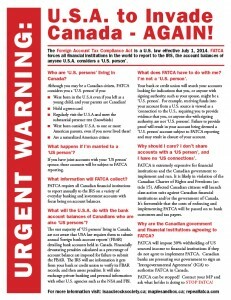 Canada FACT Fact Sheet (Word) is a plain document. 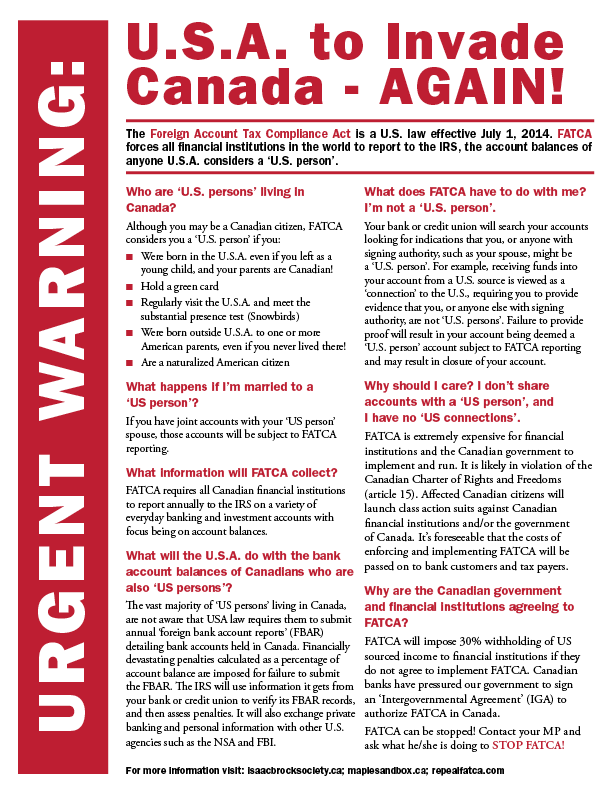 Note: If you have individualised the FATCA Fact Sheet for your country, it can be posted here too. 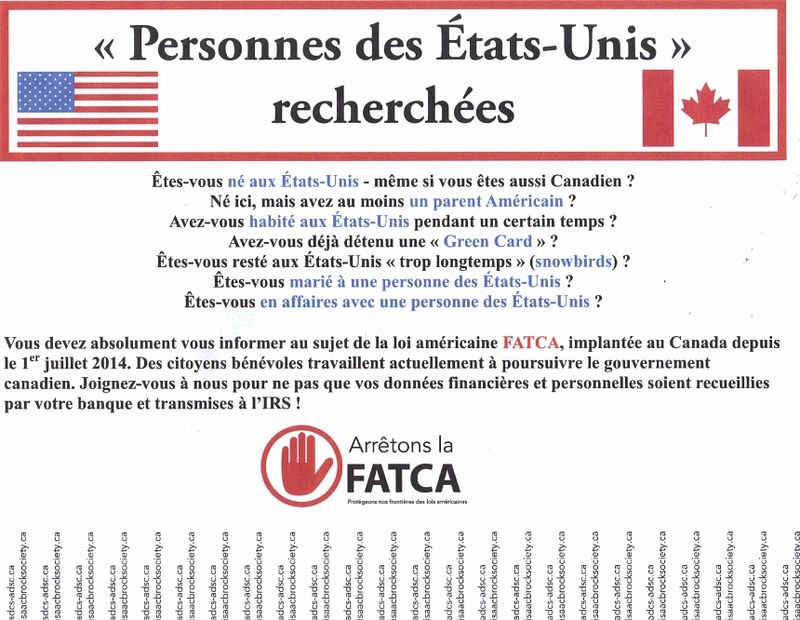 Thanks to everyone who worked on creating the FATCA Fact Sheet – a large team effort coordinated by WhiteKat – and to Gwen for its graphic design. (13) Illustrations, Clip Art, etc. the us empire has (!!!) citizen -based taxation (with North Korea and Eritirea–dictatorships–very fitting. 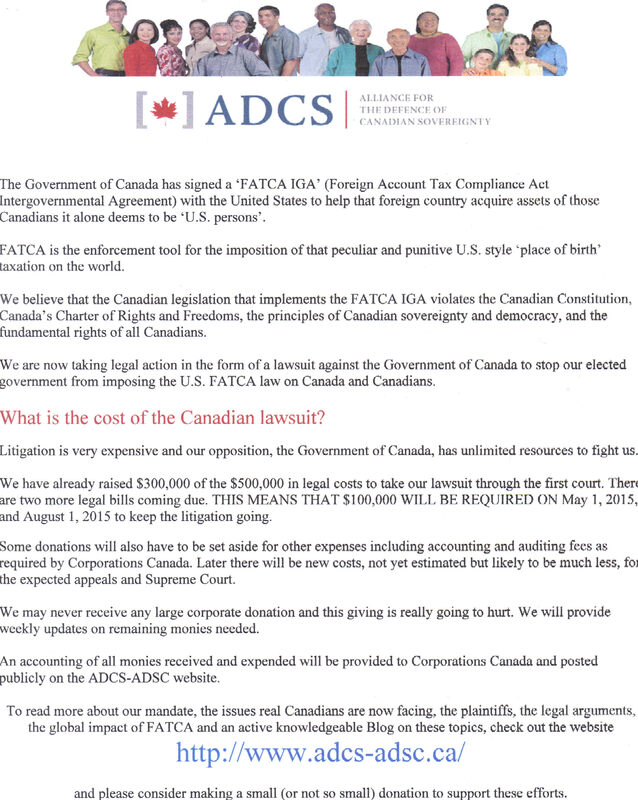 Now with FATCA–love to see how this ‘play out’ with dual citizens. Europeans are Europeans regardless of birth country. The us empire was/is a bully, and looks at its’ citizens as slaves for tax cow purposes. They need to fund all their endless wars, military bases, and hu$tling.